A grappolo, or "grape" pendant earrings, sometimes also called leech-type earrings, consist of a central leech form surmounted by a horseshoe-shaped plaque with a grape-like ornament below as a rigid pendant. The upper plaque is covered with globules, circular ornaments, decorative wires, and a frieze of palmettes and lotus flowers, all made separately and applied. A crescent-shaped repoussé relief placed beneath the leech contains the image of a lion striding to the right. The grape area is formed of seven large hemispherical bosses made separately and added; these are interspersed with clusters of small globules and a few cup-shaped flowers with plain or ornamented globules in the center. Remnants of both the hook by which the earring was worn, as well as the catch that secured the hook, are visible on the back of each example. The bases of these elements are surrounded by beaded wire. Tiny loops on each side of the hook probably held a chain or wire for added security. Piece "b" has been restored. 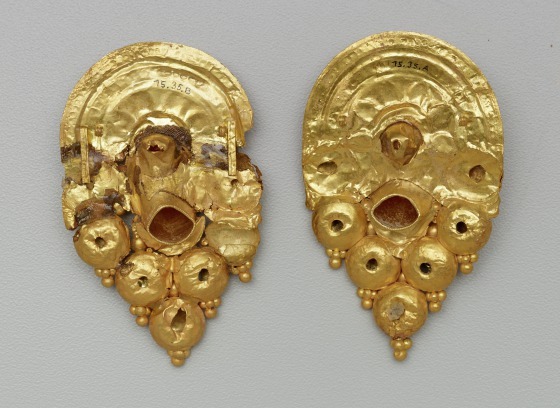 The decoration of the shield-like tops of the plates seen here recalls the organized registers of an earlier disk ear stud in the Dallas Museum of Art's collection (1991.75.18), though the palmette-lotus borders lack the granulation of the ear stud's floral motifs. A grappolo style Etruscan earrings, popular from the late 5th to the 3rd centuries BCE, are often represented in Etruscan wall paintings, as well as on terra-cotta figures. 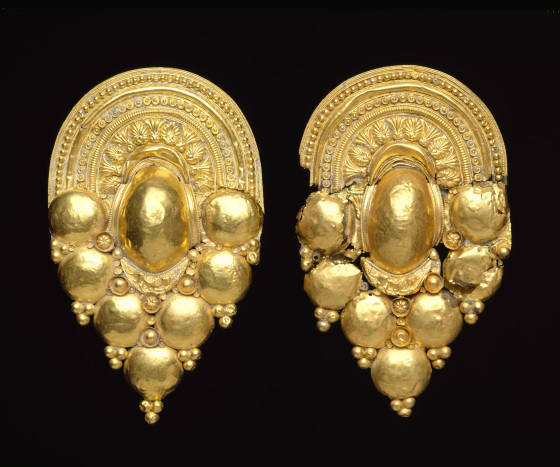 Barbara Deppert-Lippitz, Ancient Gold Jewelry at the Dallas Museum of Art (Dallas: Dallas Museum of Art in association with the University of Washington Press, 1996), 36; 127.